Imports of machinery to Italy in the first half of 2016 indicated a strengthening in the Italian plastics market, according to an analysis of data by trade group Assocomaplast. Official foreign trade data showed imports were nearly €390m (£339m) in the first half year, said Assocomaplast, which covers plastics and rubber processing machinery, equipment and moulds. This was a 9.7% increase from the first half of 2015, generated from steady growth in April-June after a negative first quarter. Italian machinery makers have been supported by export markets in recent years, while the domestic market had remained weak. But Assocomaplast said the trend in exports this year has been “much less impressive”. Following months of foreign sales dropping by -0.5% to -1% year-on-year, a low point was reached in June when exports were 2.3% lower than in June 2015.“This would seem to reaffirm the signs of recovery in the domestic market that had shown up on the radar last year,” said Assocomaplast. The group believes slowing sales in world markets may be due to the approach of the K 2016 fair in October. But there are bright spots in regional markets for Italy’s machinery exporters. Export sales of injection moulding machines in Mexico increased by 10.2% in the first half of 2016, with “a somewhat smaller one in the United States”, said Assocomaplast. Sales of flexographic printers to all export destinations were up by 19.4% in the recent half-year, with major orders from the United States and increases to other countries too. 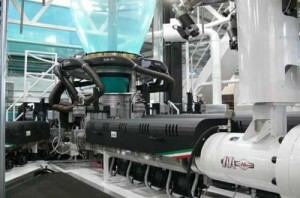 Extrusion machine exports rose by 1.9% and showed “a clear increase in sales” to Mexico and to France, the group said. In Asia, Italian machinery exports improved in the first half to China, India, South Korea and Vietnam. Sales in Iran also increased following the end of economic sanctions. In terms of imports to Italy, the data showed the biggest increase in moulds, mainly from Germany. An increase was also seen in injection moulding machines, particularly from Austrian and German manufacturers. While European countries supplying technology to the Italian plastics market recorded double-digit increases, China’s increase was limited to 2%, noted Assocomaplast.